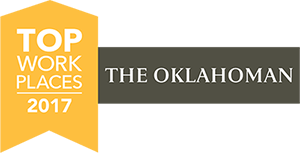 St. Mary’s Regional Medical Center has been awarded a 2017 Top Workplaces honor by The Oklahoman. It is one of 80 companies from across the state to have been selected. The Top Workplaces list is based solely on the results of an employee feedback survey administered by Energage, LLC (formerly WorkplaceDynamics), a leading research firm that specializes in organizational health and workplace improvement. Several aspects of workplace culture were measured, including Alignment, Execution and Connection. Roberts says an employee celebration is slated for after the first of the year. “It’s important to take time to celebrate our accomplishments and recognize our employees who are responsible for St. Mary’s receiving this honor,” she concludes.